There are two things I love in life and they are candles and Etsy so when these two things come together and conspire to entice me to spend my savings, I really have to share it with you. 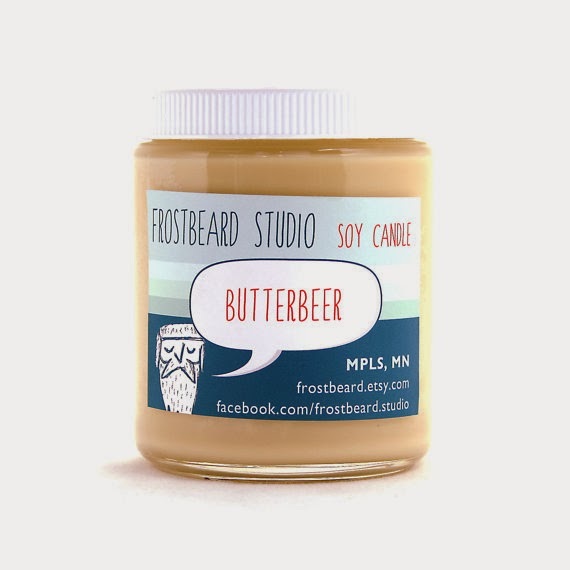 My ultimate favourite site for candles on Etsy is at Frostbeard which I am dying to try out and, until you see this, I don't think you would imagine what kind of scents they have because they are truly amazing. 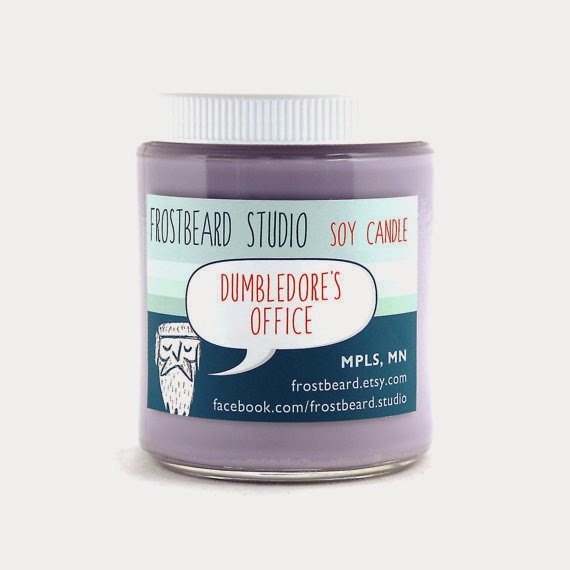 Yes, that's right, you can buy a Dumbledore's Office scented candle which is said to smell of cedarwood vanilla, fireplace and lemon. 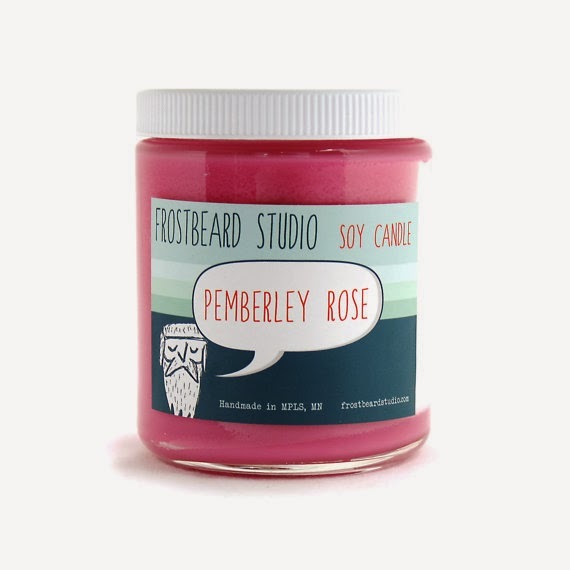 They also sell Pemberley Rose scented which I can just imagine to be amazing and is rose, hyacinth and lilac. They also have Butterbeer which is a scent I think every HP fan would love to smell constantly and is said to smell like butterscotch, creme brulee and butter rum. 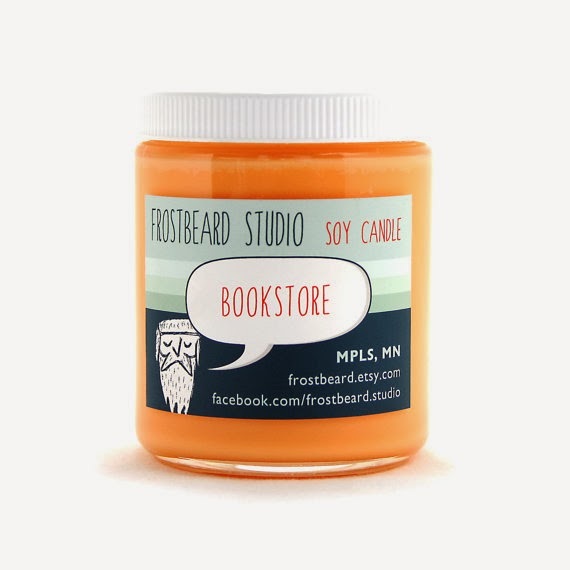 I think every bibliophile wants to be immersed in the smell of a bookstore constantly so this Bookstore candle would be perfect. It apparently smells like timber, driftwood, hazelnut cappuccino and a hint of leather. I hope you enjoyed this post and my favourites from this site. Be sure to check the site out and have a look at the other candles. I have seen these before on tumblr, I am so tempted to get all of the Harry Potter themed ones of course ;) Definitely better that the Yankee candles, why have your room smell of toffee when it could smell of Dumbledore's office! such a cute idea! etsy has the most creative things! Oh my God, I want them all! OMG I need all of these! I cannot put into words how cool these are.Such a brillaint idea and the packaging is enough to want them all. HOW. How have I not known about these candles until right now?! There goes all of my money! I need that bookstore candle ASAP. I have had my eye on these for quite some time now, how ridiculously inviting they are!!! These look and sound really look! Pretty sure I need that Butter Beer candle right now. I want to burn it and read Harry Potter.